Victoriana, based in Alness, Ross-shire. Alness High Street was crowned the best high street in Scotland yesterday. The town was named Scottish Champion at this year’s Great British High Street Awards. The high street, which has over 70 businesses including a flourishing number of independent retailers, wins £5,000 for the local community. The small town on the Cromarty Firth was announced as the Scottish Champion High Street for the 2018 Awards at a prestigious ceremony at London’s Lancaster House, attended by High Streets Minister Jake Berry MP and representatives from the 37 shortlisted high streets. High Streets Minister Jake Berry MP said: “Congratulations to Alness on being crowned the Scottish Champion High Street in this year’s Great British High Street Awards. Alness was nominated by local organisation Alness Businesses, and its reinvention over the years to become a place to find everything from florists and bridal wear to delis and bakeries obviously impressed the judges. 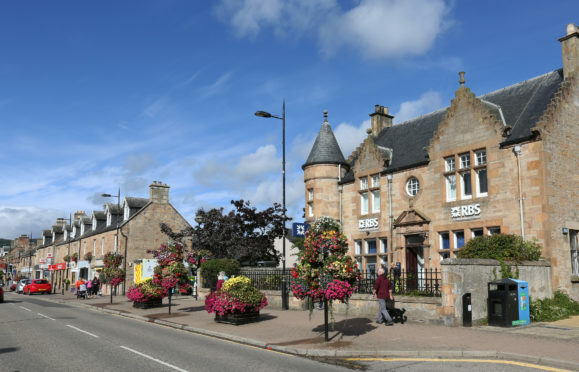 Awards judge Hemlata Narasimhan, Head of Merchant Services at Visa Europe, said: “Alness High Street is a fantastic example of a high street that has made huge strides in transforming itself and significantly improving the environment for locals and visitors alike. The Awards announcements follows visits by an independent judging panel, comprising of leading retail experts, Visa representatives and previous Award winners. The judges visited the shortlisted high streets across England, Scotland, Wales and Northern Ireland, meeting local businesses, shoppers and community organisations.